The duo will retail for $20 with $4 shipping and will include a large California Lovin' Indies vinyl sticker. Ok, enough chatting, let's see some swatches! Up first is Secret Corridors from Fanchromatic Nails which is a turquoise crelly base with iridescent flakes, purple/green UCC flakes, and blue shimmer. It dries with the tiniest amount of streaks, so just don't overwork the second coat and float it on. It dried with a satin finish and applied perfectly in just 2 coats. Next we have fall in a bottle. Doors to Nowhere is the Static Lacquer's contribution and it's a reddish brown jelly base with silver holo flakes, and a mix of several different colors of UCC flakes. 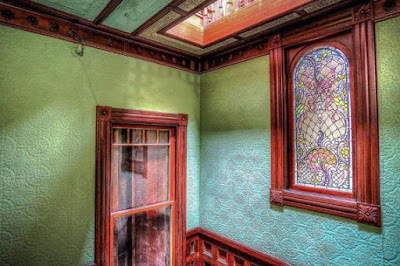 Stacy was inspired by the stained glass windows in the Winchester House photo above. Since it's a jelly, a third coat was needed, but it also added a nice depth to the abundance of flakes in there. I had no issue with flakes sticking up, and the polish had a perfect consistency. It dried with a tiny bit of texture that completely smoothed out with a coat of topcoat. There you have it! This is the perfect fall duo, and if you live in California, you'll love it for the Winchester association (side note: apparently there was a movie released this year inspired by the house with Helen Mirren in it. I will definitely watch it if it gets released on Netflix or HBO). Both polishes are beautiful, but I'm a sucker for flakies, so I'm more drawn to Doors to Nowhere. For just $24 shipped, you get 2 interesting polishes with a professional vinyl sticker. Again, these go on pre-order tomorrow at 8 AM PST through 11:59 PM PST on Oct. 5th. 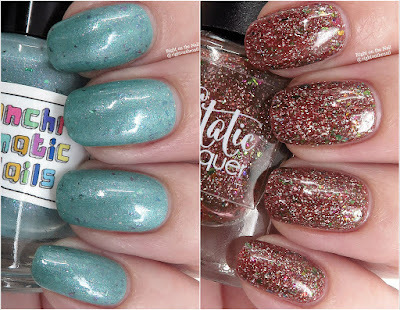 You can find out more about Fanchromatic Nails on their Etsy site, Instagram, or Facebook Fan group while you can check out Static Lacquer on their website, Facebook, Group, and Instagram pages.